Old Friends, the Thoroughbred Retirement facility in Georgetown, KY., has received a gracious donation from the Bardstown-based Kentucky Monument company. Owned by Pat and Shannon Spalding, and specializing in granite headstones and personalized memorials, Kentucky Monument has donated three new markers for graves in Old Friends's horse cemetery. In addition, the company has made a commitment to donate several granite headstones annually so that the all the horses currently interred will eventually have a fitting headstone. While touring the Old Friends facility in Georgetown, Shannon Spalding, who also owns BourbonTown Tours, also in Bardstown, with her partner Ron Freeman, noticed the discrepancy in the grave markers. “We thought every one of these magnificent animals should have a fitting headstone, regardless of their track record,” said Spalding. “So we saw an opportunity to help, and to maybe inspire others to help. “Every Old Friends retiree deserves a headstone that will withstand the test of time and be a tribute to their lives and careers,” she added. Currently, there are 84 horses interred in the Old Friends cemetery; 32 of the graves do not have stone markers. Three have already been set by Kentucky Monument: Ohio-bred millionaire Catlaunch, Turfway Park regular Easy Ellis, and Hollywood Gold Cup winner Early Pioneer. 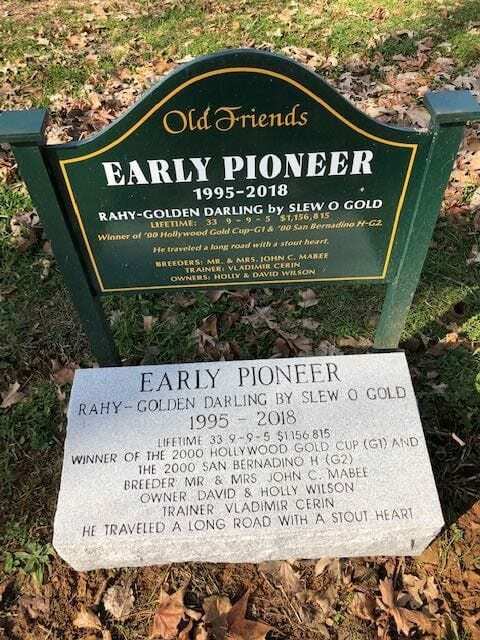 This entry was posted in Horse Care and tagged bourbontown tours, grave marker, kentucky monument, michael blowen, old friends, pat spalding, shannon spalding, thoroughbred retirement by Press Release. Bookmark the permalink.